Nowadays kids grow up with “The Spy Next Door” and “The Jackie Chan Adventures” and miss out on glorious direct-from-Hong Kong action films with no plot or acting to speak of, but Jackie’s well-intentioned grin and kicks to the face. So maybe it was nostalgia, curiosity or just because it was pretty weird that made me try today’s product. 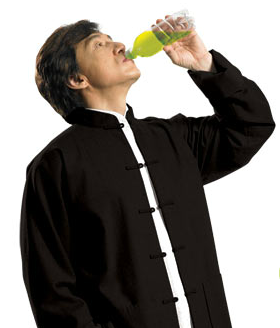 Hell, Steven Seagal has his own “energy drink” so why can’t Jackie Chan? The artificially sweetened lemon flavored iced tea powder comes packaged in the oh-so-convenient plastic tube-pouches that are oh-so-trendy these days for single serving diet tea drinks. The powder isn’t brown like Nestea or matcha green as one would expect green tea to be, but a grainy yellowish brown that plopped to the bottom of my handy blender bottle. While I don’t normally like artificially sweetened green tea (I prefer it plain/hot or cold), I shook up the bottle with some Tacoma tap water and took a swig. Taking one for the team, right? (generally the motto of our website) The concoction was not undrinkable, but a cloying mixed of faux lemon, whatever additives are added for “energy” and that classic Splenda twang. The drink doesn’t have a terribly appealing color, which is probably why most energy drinks choose to come it a totally blacked out aluminum can. Which celebrity should endorse an instant artificially sweetened iced tea mix? It’s not Jackie Chan. Come back next week when I’ve probably received a cease-and-desist letter from Jackie Chan’s agent! This entry was posted on Monday, September 10th, 2012 at 7:00 am	and is filed under Drinks. You can follow any comments to this entry through the RSS 2.0 feed. Both comments and pings are currently closed.